Time to get organising! – Chatsworth Road Festival. A few words about the Chatsworth Road Festival Group. Pictures from past Chatsworth Road Festivals. Planning for the third Chatsworth Road Festival has started and it’s all about you. Why you? Well the Festival is a community celebration of living and working around Chatsworth Road so if you do either of those things then it’s all about you. And we need you to help it happen. The Festival Group invite you to get involved and make something happen between 5th and 13th October. During last summer’s Olympics everyone was impressed with the volunteers who were ‘Games Makers’ now is your chance to volunteer and be a ‘Festival Maker’. The Festival is run by volunteers who feel strongly that this area is a great place to live and work. The first two Festivals were testament to the efforts of businesses and community groups working together. Help us to make 2013 Chatsworth Road Festival even better. If you are part of a group – be it bee-keeping or bookbinding- then make something happen that will let the folks of Chatsworth Road know more about your interest. Perhaps you have a passion for gardening, theatre or steam trains – think of a way that you could share that passion with locals and then contact the Festival Group. In the 2012 Festival we used business co-ordinators to increase the involvement of businesses. The plan worked well so we’ve extended it. This year we have a pubs co-ordinator, a community co-ordinator, an arts co-ordinator as well as schools and churches co-ordinators. You can get in touch with them by email chatsworthroadfestival@gmail.com Co-ordinators encourage you to plan an event and help you to fill in an events form so that your event is listed in the Festival Guide. 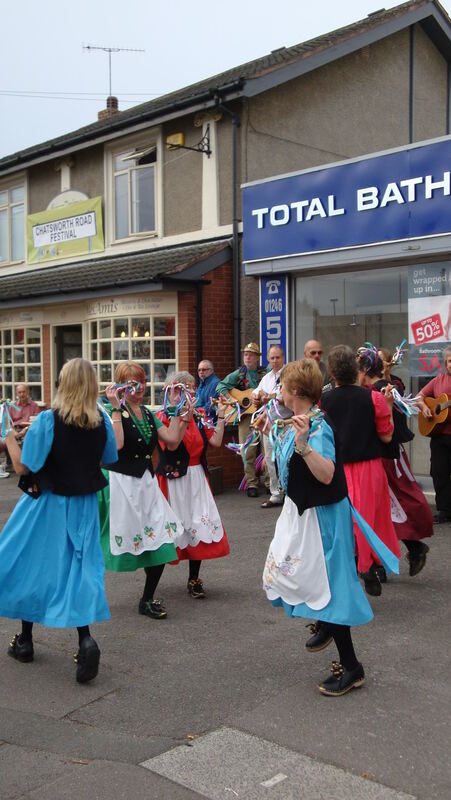 We will be having some of the regular events: the 3rd birthday of the St Thomas’ Food Fair, a ceilidh from the Brampton Community Band, the Clutter Clearance, the Morris Dancers…. But what do you fancy happening? So put on your thinking caps, send an email and join in with all the fun of the Festival. Chair of Chatsworth Road Festival Group.